Veterans Day ceremony to take place at the site this Sunday. A memorial in East Los Angeles dedicated to Mexican American veterans has been vandalized, stripped of three plaques on two monuments located at Cinco Puntos, a five-point intersection in Boyle Heights. A fourth plaque was damaged but not removed. Los Angeles police are investigating the crime as grand theft and vandalism. Veterans at the Eugene A. Obregon American Legion Post 804, which serves the Boyle Heights and East LA communities, were among the first to notice the plaques were missing, but they’re unsure when the crime occurred. Veterans of Foreign Wars Post 4696 Commander Tony Zapata suspects it could have happened during the last week of October when he was out of town. On Monday, Zapata filed a police report on the theft with the LAPD De Leon Hollenbeck Police Station. “What really gets me is that they’ve been there since 1947, and they have no value to anyone except us veterans,” the Vietnam War veteran and Boyle Heights resident told EGP. “I don’t know what day it happened,” he said. “They are probably melted by now,” he said, speculating that they may have been stolen and sold off as scrap metal. Workers and residents in the immediate area told EGP the plaques may have been missing for up to three weeks. One woman said she saw the plaques on the floor while maintenance workers mowed the lawn, but didn’t think to question what was going on. She figured they were city employees and the plaques would be cleaned and reinstalled. The three plaques appear to have been removed in one attempt, according to Hollenbeck Det. Bill Eagleson, who noted a fourth damaged plaque—bent at one corner and slightly pulled off the wall—supports that theory. 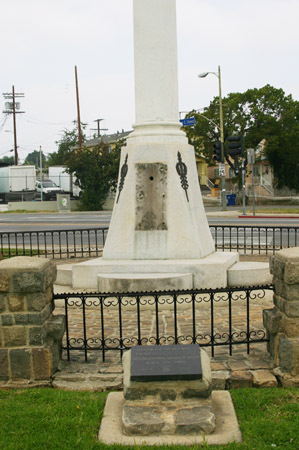 The remaining plaque on the “Mexican American All Wars Memorial” is a Spanish translation of the missing plaque located on the other side of the monument. The plaques paid homage to soldiers of Mexican descent who gave their lives in World War II, and were unveiled in 1942. The three plaques together are estimated to be worth $5,000, though some veterans and community members would argue their sentimental and historic value makes them priceless. Memorial Day and Veteran’s Day ceremonies have taken place at the memorial—located at the intersection of Avenida Cesar Chavez, Indiana and Lorena—for years. Just last May, veterans held the 65th annual 24-hour vigil and ceremony for Memorial Day. Speakers often include some of the most notable and distinguished veterans from the East LA area, such as the late three-time Pulitzer Prize-winning journalist George Ramos who was born and raised in East LA. Eagleson said the theft of copper and other valuable metals has been epidemic, with library, bridges, streetlights and manhole covers being vandalized and stolen. Some thieves have even been electrocuted during the crimes, he said. The plaques will probably be sold for 10-cents on the dollar of what the weight of the metal is worth, he said, explaining the thief or thieves did not strike it rich. Eagleson is also looking into whether the plaques could have been taken by collectors who keep them to personally display or sell. So he can’t be sure the plaques have already been melted down, he said. Rick Coca, a spokesman for Councilmember Jose Huizar, called the crime appalling and disgusting, especially in a community that values veterans as much as residents of East Los Angeles do. Pending a request for a reward from Hollenbeck, Huizar will this week ask the city council to approve a $25,000 reward for the arrest and conviction of the person or persons responsible for this grand theft and vandalism, Coca said. Zapata said the veterans are discussing the possibility of holding some fundraisers to raise the money needed to replace the plaques. Huizar’s staff will be meeting with the veterans on this topic, Coca said. In the meantime, a temporary wood plaque will be placed on the larger monument, according to Zapata. Two smaller plaques marking a time capsules’ location may not be replaced because the time capsule may have to be dug up for future construction scheduled for the location, he said. The construction is for a $10.9 million project to reconfigure the Cinco Puntos intersection into a traffic circle; the project plans will be turned over to the city in early 2013, according to Coca. The project affects the two traffic islands which have monuments dedicated to Mexican American veterans, including the Raul Morin Memorial Square. Sunday’s Veterans Day Ceremony at Cinco Puntos begins at 10am. November 8, 2012 Copyright © 2012 Eastern Group Publications, Inc. This is real sick and sad.I live down the block from 5points..and this is …no words can express how I fell..My husband, cousins,, uncles brother are Veterans..It will laden me to have to tell my brother & The Veteran’s group..The U.S.Vet Nam Veteran’s of Southern Calif. They have been color guard for passed events..
Obviously, This crime was committed by persons without the dignity or Honor that those plaques represent. It is sad that such a place of Honor for our Mexican American Veterans has been vandalized for what one can assume was for financial gain. These Men and Women gave of themselves for our freedoms, and deserve more respect and our undying gratitude. I passed by this monument everyday going home from work. No words can describe the grave action taken by those who disgrace the memories of the Mexican American veterans who fought for this country. My uncle and dad fought alongside the US Veterans during the Vietnam War, and to this day – my dad, trained with the U.S. Air Force, continues to give respect and gratitude to the thousands of men and women who given their lives! I really appreciated your web site. My parents originate from Japan, on the other hand was born in The usa. Here is the finest land on this planet. I’m hoping we ensure that it stays no cost. We’ve book marked your site to go back.